"Development Partnership Administration: Streamlining the Delivery of India's Development Assistance"
"Coming to Terms with History and Islam: Current Developments in Bangladesh"
with additional remarks by Ambassador Rajeet Mitter, former High Commissioner of India to Bangladesh. Ms. Manusmriti 'Best Officer Trainee' of the 2011Batch, receiving the "Ambassador Bimal Sanyal Memorial Prize” from Shri Salman Khurshid, Minister for External Affairs. 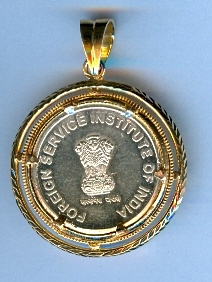 Shri N. Surie, Vice President, A.I.D. appluads. 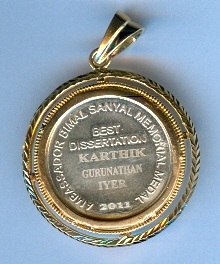 Mr. Karthik Gurunathan Iyer of the 2011 Batch of the IFS, , receiving the "Ambassador Bimal Sanyal Memorial Medal”,l for Best Dissertation from Shri N. Surie, Vice President, A.I.D. addressed the members of the Association. Mr. T. N. Ninan, formerly Editor and now Chairman, Business Standard Ltd, spoke on ‘The Implications for India of Recent Economic Developments at Home and Abroad’. Ambassador Sharat Sabharwal, till recently India’s High Commissioner in Islamabad spoke on "The State of Play in Pakistan"
Vice Admiral Anup Singh, former Flag Officer Commanding-in-Chief, Eastern Naval Command, spoke on ‘'India's Maritime Domain: Opportunities, Challenges and Security Imperatives”. 18 Mar 2014: Shri M. Hamid Ansari, the Hon'ble Vice President of India led a Roundtable Discussion on 'The Evolving Situation in West Asia'.